Life is stressful in a fast-paced society. We’ve become human do-ers instead of human be-ings! Ongoing stress exhausts the adrenals, permeates body and mind, affects organ function, digestion and sleep, and often leads to mental or physical breakdown. Pregnant women have more to consider: Pregnancy itself can be stressful, but when combined with other relentless daily energy drains, problems may crop up for both mother and developing fetus. Postpartum depression, preterm labor, low birth-weight babies–all are associated with maternal stress. A fetus growing in a high-stress womb environment has increased risks for life-long conditions such as decreased immunity, mental illness, depression, autism. Yikes! Feeling even more stressed now?!! Thankfully we have a powerful tool at our fingertips, proven to reduce stress hormones while increasing our ‘Feel-Good” hormones! This tool can be even more potent for reducing stress than medications developed for this purpose. AND it nourishes baby too! Hands and fingertips are dense with nerve endings, able to feel subtle sensations and invite relaxation. They speak a language understood by all species. They connect and stimulate. 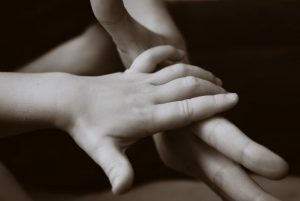 Gentle touch on your feet or belly, or receiving nurturing touch from a mate, friend, or massage professional, can actually reduce stress, enhance immunity, and help you feel more connected to yourself and others, including your unborn child. Nurturing Touch is not just a pleasant experience; It’s like an essential nutrient (“Vitamin T” (Touch!)). • Touch stimulates release of oxytocin, the hormone that helps us feel loved, sexual, and secure. • Touch enhances baby’s brain development and growth of myelin sheaths that protect the nerves–in utero and after birth. Yes, in utero! Your baby is stimulated by the touch of your womb wall against her/his skin and by your hand rubbing your belly—touch is even more compelling for babies than your voice or food! • Without Touch a baby will fail to thrive, develop serious physical-emotional deficits, or will die from touch starvation. • Stressed pregnant women who received 20-minute massages twice weekly, had increased levels of serotonin and dopamine, decreased cortisol and adrenalin, less postpartum depression, and half as many premature births, as non-massaged women! • Massaged pregnant women touched their infants more frequently and confidently after birth. These babies showed better immunity, higher IQ, increased social interaction skills, and stronger bonding with their mother than those of non-massaged mothers. Touch is potent medicine that’s always available! Simply holding a hand or rubbing a shoulder can decrease blood pressure!! Hugging makes people healthy! A Carnegie Melon University study reported that people who got more hugs, had fewer colds or decreased symptoms. Touch. Be touched. Make the world a healthy world!